See New York City from the top with this special combo ticket that includes both our All Around Town Tour and tickets to the Top of the Rock. 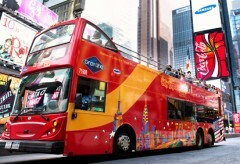 2-day double-decker bus tour featuring unlimited hop-on, hop-off access on Uptown, Downtown, and Brooklyn Tours PLUS admission to the Top of the Rock Observation Deck! Added Bonuses: FREE Night Tour, Hop-on Hop-off Sightseeing Ferry Tour, admission to the Museum of the City of New York or the New York Historical Society, and an Eat and Play Discount Card – all with just one convenient pass! Looking for a unique excursion in New York City? Let our experienced tour guides lead the way! Hop on our comfortable double-decker bus and discover Manhattan and Brooklyn with 5 exciting and remarkably distinct tour loops! Seated high above the city streets, you’ll cruise around town passing the most iconic landmarks and attractions. See what the hype is all about at hot spots like Times Square, Central Park, the Empire State Building and Radio City Music Hall. Plus, your 90-minute ferry ride offers incredible views of the Statue of Liberty and Ellis Island – must-see attractions for first-time visitors! Along the way, feel free to hop-off at more than 40 stops throughout Manhattan, and Brooklyn to dig deeper into the city’s rich history and culture. Relive the glory days of baseball legends at the old Yankee Stadium grounds, delight in authentic pasta dishes in Little Italy, or window shop at the prestigious stores on Fifth Avenue. Make sure to hop off at the famous 30 Rock building, because you’re going to see New York City from the top – The Top of the Rock, that is! Three floors of indoor and outdoor decks offer awe-inspiring panoramic views of the majestic cityscape. Standing at 850 feet, 30 Rockefeller Center isn’t the tallest building in New York City, but the view from the top is widely considered the best. Afterall, it’s the only place to get an unobstructed view of the Empire State Building! Come discover what makes New York City such a popular destination. Book your tour today for unparalleled sightseeing at an unbeatable cost! Tour lengths vary based on the route and range from 90 minutes to 3 hours. Locations vary by tour. Please refer to individual tour descriptions under the “Ticket Includes” tab for specific locations. 8:00 am - midnight. Last elevator departs at 11:00 pm. Individual bus passes for our Uptown, Downtown, Brooklyn and Bronx tours are valid for 24 consecutive hours from the time you redeem your voucher in New York City. Our All Around Town Tour is valid for 48 hours or 72 hours, depending on the package you choose. A 2-day/48-hour pass is valid for 48 consecutive hours from the time you redeem your voucher. A 3-day/72-hour pass is valid for 72 consecutive hours from the time you redeem your voucher. Reviewed on 10/29/2015, By Wayne P.
Great Statue by night ride, good bus tour, happy with all tickets. Reviewed on 10/27/2015, By Nagarjuna P.
Reviewed on 10/26/2015, By Allan H.
Reviewed on 10/25/2015, By Aleksandr P.
Everything was fine and smoothly. However, your experience will depend personally on guides. Some of them are really amazing, really perfect. But some of them are so-so. Reviewed on 10/25/2015, By Autumn s.
Reviewed on 10/24/2015, By Maria S.
Really great information is shared during the tour. Reviewed on 10/20/2015, By Pankaj J. Great experience in visiting the New York with CitySights ! Reviewed on 9/22/2015, By Maria Isabel Hidalgo J.
I would recommend to issue the city sights NY to all my friends. Good frequency and nice itineraries. Very helpful to obtain a global sight of the city and restful for a so tired life of tourist. Reviewed on 9/16/2015, By Anne S.
Reviewed on 9/13/2015, By Jatan P.
awesome experience and very good service. You can upgrade to the Super New York Tour for just $18 more?